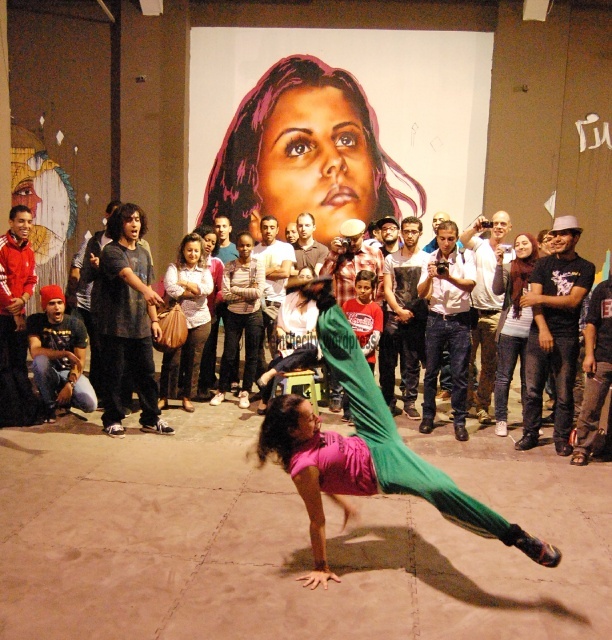 Eva Mena, aka Den, is a 33-year-old graffiti artist from Bilbao, Northern Spain, who came to Egypt this week to take part in the Fourth Mediterranean Hip Hop Festival (also called Meeting of Mediterranean Urban Culture for some reason), sponsored by the Spanish Embassy in Cairo and held in Townhouse Gallery and the Cairo Opera House. 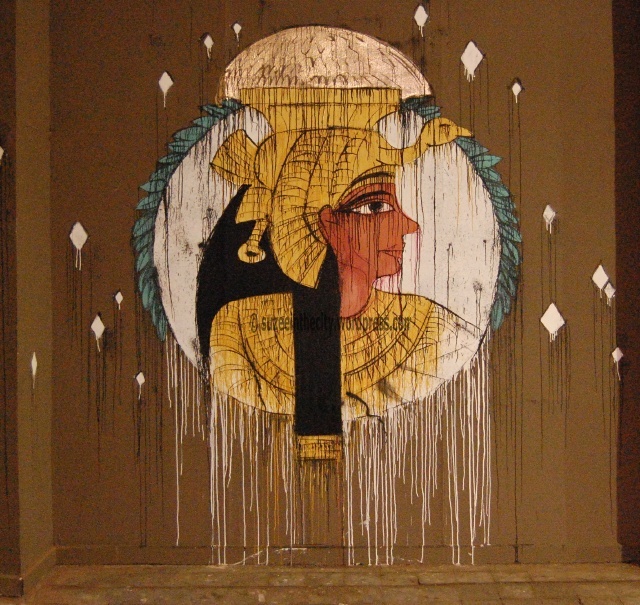 I was really excited when Eva contacted me before coming to Egypt, especially after visiting her website: this women is an incredible artist with beautiful murals and yeeears of experience: Eva’s been painting since she was five and has been making graffiti since 1995, which probably explains how she managed to make this amazing mural on the Townhouse Factory wall in just one day. 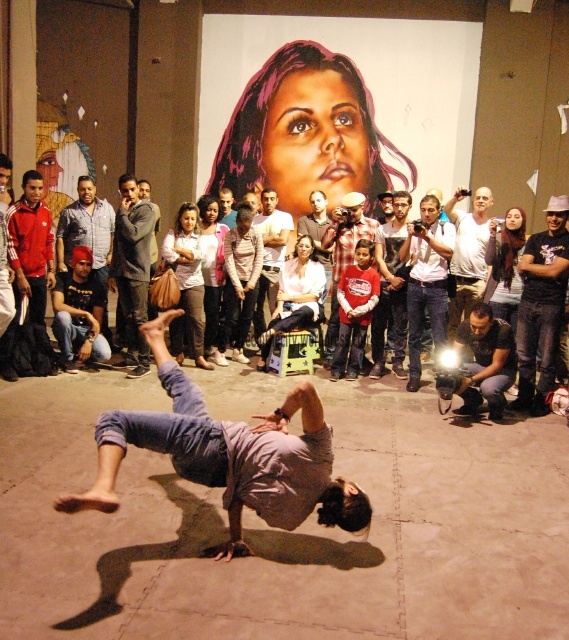 Things didn’t really go as planned for Eva: she was supposed to collaborate with Alexandrian graffiti artist Aya Tarek, who had to cancel due to conflicting schedules, leaving Eva with half the factory space to work on. Additionally, Townhouse had given Eva and her crew just two days to work on the whole space, which is frankly next to impossible. 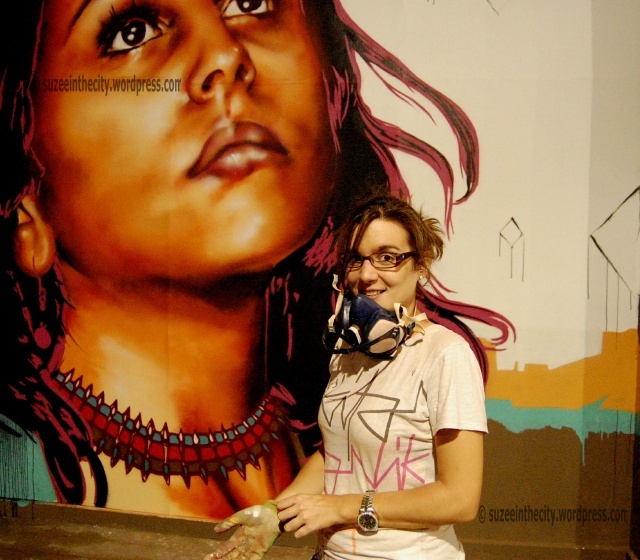 Luckily, Eva’s friends, fellow Spanish graffiti artists Zeta (pronounced Theta- the Spanish word for the letter) and Elpho helped her out with their own murals and graffiti contributions to the walls. Eva’s muses are a young boy from the Downtown neighbourhood of Townhouse and the girl friend of one of the organizers of the festival. All she did was – get this – take photographs of the muses, play around with the images on photoshop, and then print them out on A4 papers. And then she – get this- painted these images freehand. No stencil, no measurements, nothing. FREEHAND, using plastic paints and spray cans from Spain. Each image took her about four hours total. Did I mention FREEHAND? Seeing Eva’s artwork up close is both inspiring and intimidating, yet she’s so friendly and laidback about it all- graffiti comes naturally to her and she’s been doing it for so long, it’s just part of her cheerful and easy-going nature. 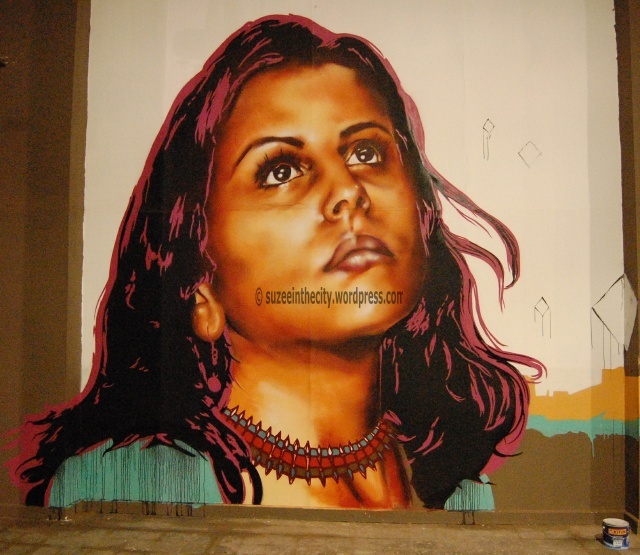 It’s interesting to meet a female graffiti artist who can totally hold her ground against contemporary male graffiti artists, and who isn’t that concerned about keeping her identity hidden. Mashy so Spain isn’t exactly being ruled by a military dictatorship these days, so it’s pointless to compare the scenes, but still… At first, she would avoid showing her face, ‘because graffiti is about this,’ she says, pointing at the wall, ‘Not me.’ But after several people assumed she was male just because her artwork was that good, she decided to show her face. 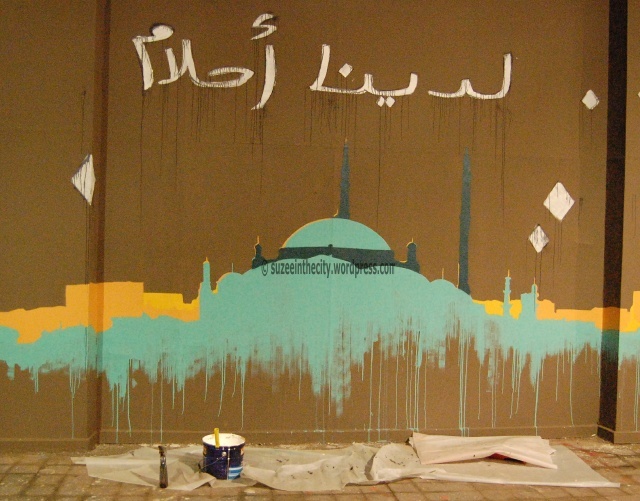 Even though she was in Cairo for only a few days, Eva plans to return soon (maybe for another collaborative graffiti project) and only has good things to say about the graffiti scene in Egypt. 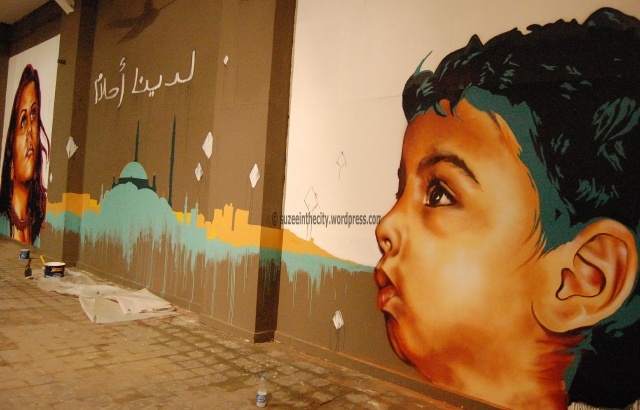 ‘Now, the graffiti scene is growing,’ she told me, ‘Which is very important because of [Egypt’s political] situation. Graffiti here is saying what the people on the streets are saying, and that’s important. ‘The only problem that Eva sees is the lack of good quality paints. 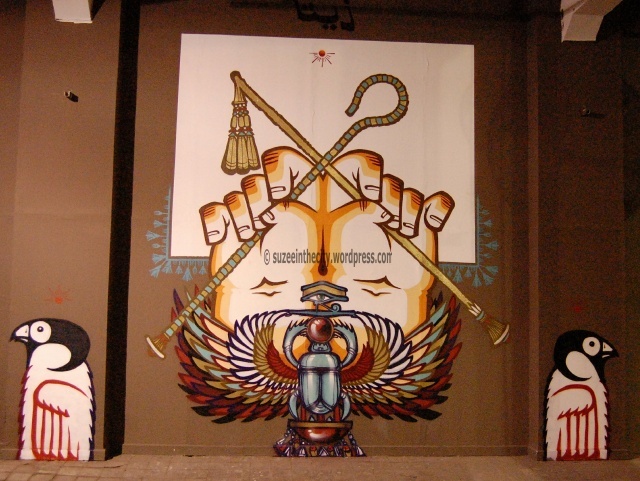 For more information about Eva and to see more of her murals, check out her website. 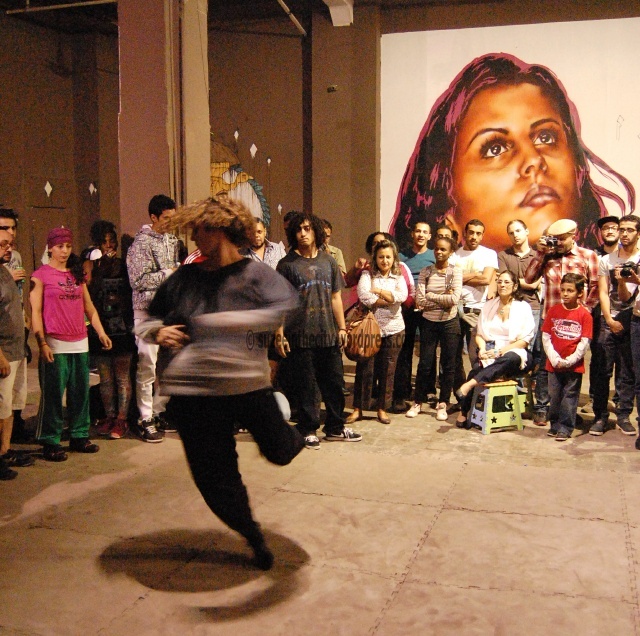 Despite the last-minute hiccups and minimal publicity around the event, the atmosphere inside the Factory Space was both positive and energetic: the dancers, artists, organisers and documentary makers from Spain were very friendly and eager to meet and converse with their Egyptian counterparts. 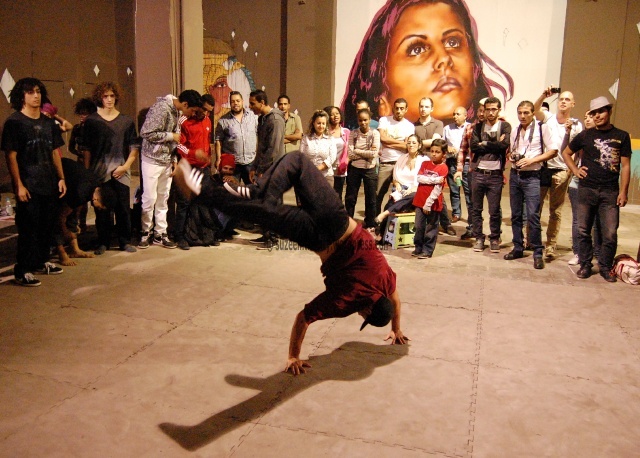 It was really cool to watch a group of Egyptian and Spanish breakdancers spar and feed off each other’s energy. More of these events should happen in Cairo. 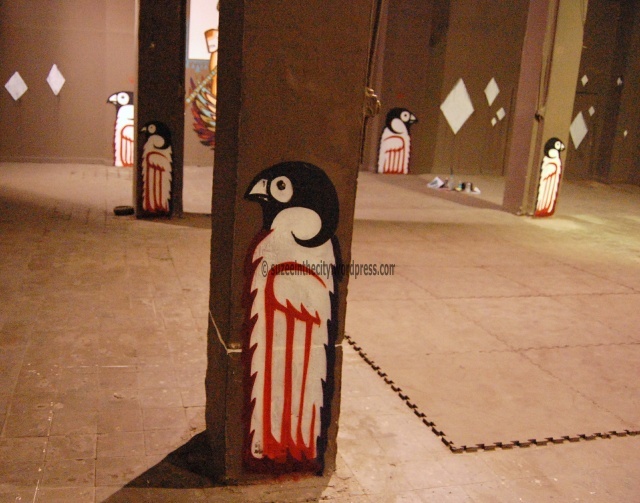 This entry was posted in Street Art Fascination and tagged Aya Tarek, Bilbao, Cairo Graffiti, Collaboration, Den, Downtown Cairo, Elpho, Evan Mena, Freehand, graffiti, hip-hop dancers, Madrid, Medhiphopfestival, Mediterranean Hip Hop, Plastic Paints, Spain, Spanish Embassy in Cairo, Spanish graffiti, Townhouse Factory Space, Zeta. Bookmark the permalink.